Assassin’s Creed comes back with a bang after a brief hiatus last year, breaking the habit of consecutively releasing games year after year since Assassin’s Creed II in 2009, and boy did it pay off. Assassin’s Creed: Origins is the 10th major installment in Ubisoft’s beloved franchise, and marks the beginning of a new era in the series. The game is primarily set in 47 BCE at the end of the Ptolemaic period in Egypt during the rise of Cleopatra as the last Pharaoh. The game follows Bayek, a Siwan Medjay who represents old Egypt in an everchanging political climate. Through him, the player is able to see the cultural clash between the native Egyptians, the newly settled Greeks, and the growing presence of Rome. Although I would have liked the game to be set much earlier in Egypt, I did appreciate the various cultures and how Ubisoft managed to accurately portray a very complex Egyptian society in a time of great change. Origins takes the player back farther than it ever has before, and shows us the creation of the Brotherhood. Bayek is accompanied by his loyal eagle Senu, who acts as his eyes and ears in the sky in place of traditional Eagle Vision. This is only one of many changes in Assassin’s Creed: Origins that might leave fans feeling a little skeptical, but more on that later. Assassin’s Creed: Origins breaks many habits that the series has built up over years, but it also reinvents traditional elements. Although nothing is without its issues, Origins really has resurrected a series that was developing a bit of a reputation alongside similar perpetrators like Fifa and Call of Duty. Alongside many newly introduced RPG elements, Origins introduces a new crafting system which requires the player to make weapons and upgrade armour components. These are vitally important in the long run, so I would suggest upgrading your damage and health as soon as possible. Bayek will level up based on a standard XP-based system, which will increase your overall health and damage on its own, but crafting is vital to success. The hidden blade also needs to be upgraded a total of 9 times before it’s at its most powerful, and even then you might come across enemies that won’t fall in one hit. Initially, I thought I’d take issue with this yet it didn’t annoy me as much as I anticipated while playing. The game shows you how much damage the blade will do before you strike, meaning that you won’t unknowingly enter combat with a strong enemy because your blade isn’t strong enough. The game also shows how much damage bows will do when aiming them at an enemy in the same way, with more damage being done if you hit a critical area such as the head. New to the series, Assassin’s Creed: Origins joins most games of the last couple of years by introducing a photo mode to the game. Photo mode includes filters, focus points, and different angles that the player can mess around with to get the perfect shot, and I for one spent a lot of time posing Bayek to get an impressive looking screenshot. Although it’s not as advanced as the photo mode in games such as Horizon Zero Dawn, it really doesn’t need to be. Origins is a ridiculously beautiful game that doesn’t need the extra camera options to make it look incredible, and instead relies on the landscape and natural lighting of the environment. Along with the main missions and a wealth of side missions, Assassin’s Creed: Origins also offers location based challenges such as camps to clear or tombs to raid. This is a great way to earn xp, and was actually a lot more fun to complete than I anticipated. I’ve played through the entire story and sunk in almost 30 hours so far, and I still haven’t scratched the surface of all of the extra missions and hidden treasures that Assassin’s Creed: Origins has to offer. This can be a bit overwhelming for a completionist like myself, but it does provide hours upon hours of content above what the main story alone offers. Something that I was particularly curious about before release was the language spoken in game. Assassin’s Creed is known for its attention to detail, especially when it comes to recreating locations as accurately as possible. The language spoken by the crowds is largely based on Sir Alan Gardiner‘s Middle Kingdom Egyptian Grammar, along with the works of James Allen and Raymond Faulkner amongst others, and is a reconstruction of Demotic Egyptian. Not only is this ridiculously impressive, but as someone who has attempted to study ancient languages I can tell you it’s incredibly difficult. It perfectly sums up what I love about Assassin’s Creed, as that level of authenticity and attention to detail is unparalleled in most reconstructions of the past. Origins also feels much more authentic than previous games, partly because of how alive the environment feels. Convoys with materials, NPCs, and wild animals help build the narrative of the world and make it feel like Bayek is travelling through an already existing world, as opposed to a world solely based on the player’s existance. Among the many changes introduced in Origins, Senu’s eagle vision is perhaps the most noticeable. Instead of using the traditional Eagle Vision to see through walls and target enemies, players will have to take control of Senu and scout ahead to see objectives, enemies, and treasures. Although I struggled with the idea at first, I found it very endearing to use Senu to guide me, and its not too dissimilar to Far Cry Primal’s use of an owl companion. In addition to not having traditional eagle vision, view points no longer serve such an important role. When you travel to a new city, a fast travel point automatically becomes available. View points help the player in another sense, however, as each tower unlocked contributes towards Senu’s perception. After I had synchronised with every view point, all 58 of them, Senu was able to see resources for miles upon miles. This is incredibly useful when hunting for material needed to get those pesky upgrades. There’s also a more robust loot system in place now, which means you no longer just loot items from bodies, but also chests, bags, and amphorae. You can also loot weaponry, meaning I didn’t purchase anything throughout the game and instead relied on getting better and stronger weaponry from high level enemies, such as the Phylakes. 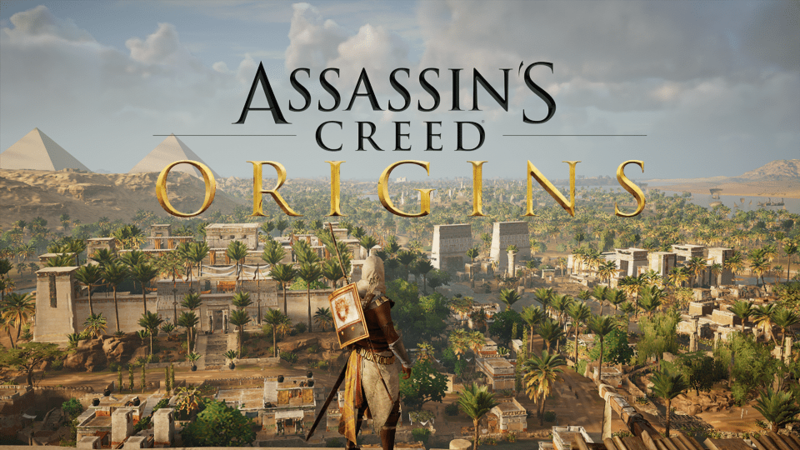 One of the best ways Assassin’s Creed: Origins embraces the core elements of a traditional RPG game is with the introduction of a skill tree. The skill tree has three main branches: warrior, hunter, and seer. These can be developed with ability points, which are awarded with each level gained and by exploring the three pyramids in Giza. As a huge fan of RPGs, I really enjoyed the inclusion of a skill tree as it gave a real sense of progression which is often lacking in Assassin’s Creed games due to most of the skills unlocking via the main story rather than player actions. The combat in Origins has also been overhauled, and I have to say it feels very satisfying. Figuring out tactics early on is essential to succeeding in open combat, rather than relying on obvious button prompts and parrying every time someone strikes as has been the case in previous games. Overall, I am extremely pleased with the changes that Ubisoft have introduced in Assassin’s Creed: Origins. They managed to shake up a familiar formula enough to make it interesting again, yet it’s still very recognisable as an Assassin’s Creed game. Even the changes that seem like a downgrade from previous games serve some purpose in Origins that ultimately make them worth it, such as view points. Although Assassin’s Creed: Origins is graphically beautiful, it was clearly optimised for the PS4 Pro and the Xbox One X rather than the standard PS4 and Xbox One. I played Origins on my standard Xbox One, and I experienced a hand full of crashes, and several framerate or texture issues from time to time. Although this didn’t ruin the experience of the game for me, it does disappoint slightly considering it feels like it was targeted at the more expensive versions of the consoles. In addition to this, Assassin’s Creed: Origins falls victim to one of the deadliest sins a developer can commit: microtransactions. Although these aren’t as obvious in game, Uplay automatically awards you with 700 Helix credits to spend in store. By doing so, the store flashes all of the lovely bonuses, weapons, mounts, and outfits that were held back from the game in an attempt to make you part with your real money. To be fair, this isn’t a new feature in an Assassin’s Creed game, so I can’t complain too much that it’s featured in Origins as well. As a huge Assassin’s Creed fanatic, I was looking forward to Assassin’s Creed: Origins’ release, and I had extremely high expectations. Although Origins is not a perfect game, it comes pretty close. As an Assassin’s Creed game, it reinvents some pretty stale mechanics whilst also staying true to the series. As an open world RPG, Ubisoft’s Egypt is a beautiful and vibrant world. It feels alive and is absolutely brimming with things to do and see long after the main story is finished. Assassin’s Creed: Origins has managed to live up to my expectations, and I whole heartedly recommend it to both long terms fans of the series and newcomers. Ubisoft managed to combine two of my favourite things, Assassin’s Creed and Ancient Egypt, and make a game that perfectly combines both in a game that I will happily get lost in for hours to come.